Ross County co-manager Stuart Kettlewell has urged his players to make themselves immune to the threat of losing their place in the Staggies’ starting line-up. County underlined their strength in depth in last weekend’s 0-0 Highland derby draw against Caley Thistle, with Iain Vigurs, Josh Mullin and Declan McManus starting among the substitutes before coming off the bench to help the Staggies finish the match strongly. Kettlewell insists he and fellow co-manager Steven Ferguson will require a squad effort for their Championship push, however he says strong performances will make the job of picking the team more straightforward. County take on Dundee United at Tannadice today, and Kettlewell said: “We always knew we’d need a strong squad for the Championship. “Football has changed a bit. In years gone by, a lot of success would be built on this group of 11 players. It was a case of, that’s all we need and this is how we’ll play. “Anybody who doesn’t get the nod on a Saturday needs to remain a good team-mate. They may still have a real hand in the game, such as the three who came on in the Highland derby. “I hear people saying it must be a headache for us with the group of players we have, with guys expecting to play. “We hear that but we believe we’ll need a strong group over the course of the whole season. “It is not something that gives us a sleepless night. We have to have the courage of our convictions and pick a team in relation to who we play against and how they can be effective. “Steven and I will continue to do that. It is up to the players – make yourself indispensible. 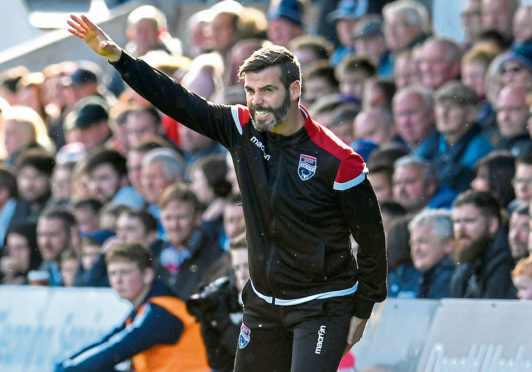 County are behind today’s opponents United on goal difference, and Kettlewell expects Csaba Laszlo’s side to be one of the main threats to the Staggies’ title hopes this season. Kettlewell, who is without skipper Marcus Fraser through a shin problem, added: “Dundee United have recruited a number of players. I believe they’re a stronger side than last season. “It just makes for a good game in what has been a Premiership fixture in the recent past. “Dundee United will be there or thereabouts come the end of season. We’ve played them once already in the Betfred Cup and it was a really difficult game, but a decent one for us.